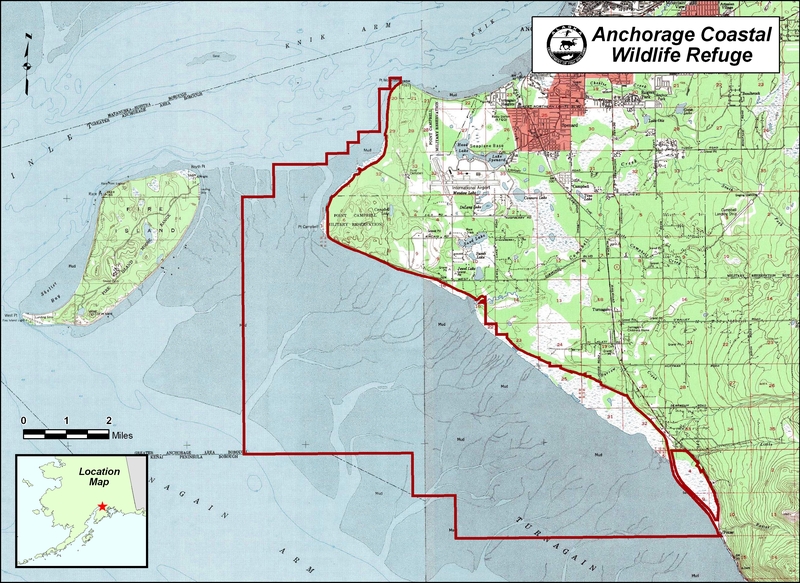 Anchorage Coastal Wildlife Refuge extends from Point Woronzof southeast to Potter Creek, a distance of 16 miles, but is best known for that portion located between the Old and New Seward highways called "Potter Marsh." Potter Marsh was created in 1917 with construction of the Alaska Railroad embankment. 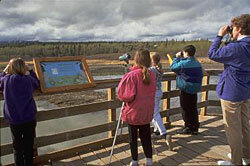 For more information on the Anchorage Coastal Wildlife Refuge please refer to the Anchorage Coastal Management Plan. For current land status information, see the Anchorage Coastal Land Status Map (PDF 704 kB). You may also download the KML file which depicts the refuge area boundary. See also the Potter Marsh Interpretive Plan (PDF 3,011 kB). The next Potter Marsh Discovery Day will be held Saturday, June 1, 2019, 11am to 4pm. See the Potter Marsh Discovery Day page for details. Click on a podcast below to listen to audio natural history tours of Potter Marsh, organized by each of the four seasons. These audio tours were funded by the U.S. Fish and Wildlife Service and produced by ADF&G in partnership with Audubon Alaska and the Bird Treatment and Learning Center and Friends of the Anchorage Coastal Wildlife Refuge (FAR). Thanks to Ken Flynn of the Raven’s Nest for the audio production and editing.